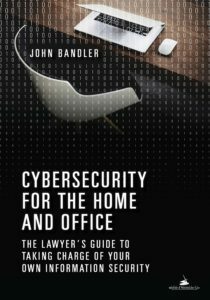 Cybersecurity for the Home and Office: The Lawyer's Guide to Take Charge of Your Own Information Security, is available from the American Bar Association website. Some things could not be included in the book, so this website has some additional helpful information. This page outlines the book, and has links to acknowledgements, photos relating to Chapter 5 (how computers work), Chapter 6 (networking), cybersecurity and cybersafety additional resources, and forms helpful for home and small office cybersecurity organization including the Personal Device and Data Summary. Are you looking for a Glossary of information security terms? Use this website to follow along with Chapter 5 and Chapter 6, which have some technical terms and the pictures on this website will be helpful. Here's a table of contents for the full book. My original forms had to be edited to meet book publishing format and page size. The forms on this site are convenient for printing and writing on. I have also updated and created new forms since publication.